When people think of bots, they think of viruses or code let loose by unscrupulous hackers in an effort to disrupt all that is good in the world of the web. That’s quite the opposite with the Facebook Messenger bot which is built entirely for website owners to engage with their visitors and drive more traffic to their site. Facebook Messenger is revolutionary in the online marketing world and gives marketers the opportunity to boost their customer-base through Facebook and its extensions. It’s been reported that website visitors are several hundred times more likely to take an action if they can chat with a human right on the site itself. An automated chat bot makes this possible which is what makes it so powerful, so effective and so important for any business that wants to drive sales. With so many hundreds of millions of Facebook users, it only makes sense to utilize this incredible tool to the fullest. As more and more companies are gaining an online presence, it’s crucial to stay on top of the competition and keep up or in front of the very businesses that are fighting for your customers. Facebook isn’t just a social place for people to hang out and connect with family and friends, it’s a search engine in itself which people are using for current news, events, research and to do their online shopping. The Facebook Messenger chat bot is so sophisticated that it can pose as a human and ensure that customers are getting the information they want. And when customers are satisfied, they are far more likely to hit the buy button. 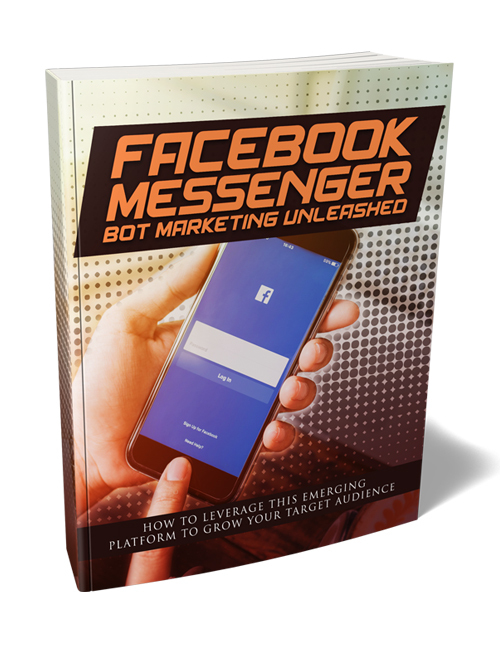 In this guide which complements the Facebook Messenger Bot Marketing Unleashed videos, you’re going to learn why you absolutely must get on board the chat bot hype which is growing by leaps and bounds. Every marketer running a business and every business that’s looking to ramp up customers and sales needs to get a hold of this bot right away. Many are using it successfully with many more still unaware. Ultimately everyone who owns a business will be implementing the Facebook Messenger bot. That’s why it’s imperative that you get on it now. If you’re still unsure, this ebook will give you the full rundown and how to get it set up. You’ll discover how the FB Messenger can grow your audience and boost your business, how to walk your customers through your sales funnel, how to automate the entire chat experience for your potential customers to ensure a seamless conversation and much more. If you’re ready to make huge changes to elevate your sales then this is the guide you need. Get it now. Package includes a professional sales-letter and ready-to-go sales materials.